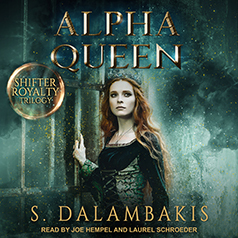 S. Dalambakis presents Book 3 in the Shifter Royal Trilogy. Contains mature themes. The cat is out of the bag and everyone learns that Callyn is the next Alpha Queen. She gains a friend in Catori Na'Estse, a girl who was also wronged by Kelsey. Callyn has officially claimed all of her mates and has shifted, gaining some new abilities along the way. Soon, they realize there are people who don't want to see her ascend to the throne. They will stop at nothing to make sure she doesn't take her rightful place as Alpha Queen. After almost losing her life, Callyn realizes just how far some people will go for power, greed, and jealousy. Tension is mounting and enemies are known. There is a war on the horizon. Now is the time Callyn and her mates need to be closer than ever. Can they strengthen their bond even more and defeat their enemy or will their enemy come out on top?